The Nikon 28mm f/1.4E commands a premium price due primarily to the volume of quality glass that allows it to shoot at the wide f/1.4 aperture: otherwise, you can spend a fraction of that to pick up a 28mm lens with a maximum f/1.8 aperture. Wide-open, the lens is surprisingly sharp in the central region of the frame. Given the wide angle and super-bright aperture, there is some noticeable softness in the corners, which we expected (but it's all fairly reasonable). As the lens is stopped down, the corners become much sharper, peaking at f/5.6, and then being subject to diffraction limiting as the lens is stopped down further. Fully stopped down at f/16, there is a generalized softness across the entire image, though probably, this is a lens you won't use at f/16 anyway. Of course, when you buy a $2,000 lens whose chief feature is to shoot at f/1.4, you're probably going to spend a lot of time shooting it at that aperture. You can't expect edge-to-edge sharpness unless you stop down significantly; on a full-frame camera like the D800E, this is achieved at f/5.6. However, the 28mm f/1.4E has its own unique character, and the dreamy quality of images it produces -- with a sharp central portion, and a slightly soft corner portion -- can be extremely compelling. Finally, it's not like there is a complete destruction of detail in the softness: according to the numbers, it's only a few blur units above absolute sharpness. The lens does well in preventing chromatic aberration, both in the corners and in wide-aperture situations. We've noticed that with very fast prime lenses (in the f/1.4 category, or faster), some exhibit a notable amount of lateral chromatic aberration that appears when the lens is used at its fastest apertures. Happily, this isn't the case with the Nikon 28mm f/1.4E. There is a slight amount of chromatic aberration, which appears as blue fringing in areas of high contrast. The Nikon 28mm f/1.4E does show signs of corner shading when the lens is used at its f/1.4 aperture -- quite significant signs, actually. At f/1.4, the extreme corners of the lens are just over a full stop darker than the center of the image. Vignetting is alleviated as the lens is stopped down, with negligible shading visible at f/4 or smaller. As a wide-angle lens, some level of distortion is generally unavoidable, and in the case of the Nikon 28mm, there is some light barrel distortion: approximately 0.4% in the corners, and 0.2% throughout the image on average. We haven't tested this venerable workhorse, as it's been out of production for some time. It's well-regarded by those who have used it, but for the premium price you'd pay for a used copy, it's probably better to shell out for the newer E-version. Though we've also yet to test this 28mm prime in the lab, this more recent Nikkor 28mm prime is only 2/3 of a stop slower than the f/1.4E version yet is a whopping ~$1,300 less expensive. This enthusiast- and pro-level lens features Nikon's top amenities, including Nano Crystal Coat, a Silent Wave Motor (SWM) AF system and weather-sealing. For just over a tenth the price, you can get the slower f/2.8 version of this prime lens. You don't get near the same level of light-gathering ability, nor do you get the latest technical features such as the electronic aperture. But if you're just looking for the 28mm focal length and don't need such a wide aperture, you'd do well to consider this lens. With a price point of $2,000, the Nikon 28mm f/1.4E is unquestionably a luxury lens, but its combination of bright aperture and wide-angle focal length can lead to some unique images. The lens has a lot of character at its widest aperture: if you are looking for edge-to-edge sharpness at f/1.4, you won't find it in this lens by its nature, but the images it produces can be very interesting indeed. works out in the field, please see our in-depth Field Test. As appropriate, we shoot these with both full-frame and sub-frame bodies, at a range of focal lengths, and at both maximum aperture and f/8. For the ''VFA'' target (the viewfinder accuracy target from Imaging Resource), we also provide sample crops from the center and upper-left corner of each shot, so you can quickly get a sense of relative sharpness, without having to download and inspect the full-res images. To avoid space limitations with the layout of our review pages, indexes to the test shots launch in separate windows. Nikon 28mm f/1.4E ED AF-S lens on the Nikon D800E, f/9.0, 5s, ISO 100. Nikon has continued its prime lens updates with the new Nikon 28mm f/1.4E ED AF-S. This fast optic offers a wide 28mm focal length on full-frame cameras and a 42mm-equivalent focal length on crop-sensor DX bodies. It is worth pointing out that the 28mm f/1.4E is very much a professional lens, as is evidenced by its advanced features including an electromagnetic diaphragm and fluorine coating. If the features list doesn't tell you who this lens is aimed at, its price tag definitely will, as the 28mm f/1.4E comes in at just under US$2,000. That is a very expensive prime lens, but it is also fast. When you need the extra light gathering capabilities, the high price tag of fast prime optics is typically justified. If you don't need the extra speed, Nikon's relatively recent Nikon 28mm f/1.8G lens costs $700. For the extra $1,300, you get the electromagnetic diaphragm, two more aperture blades, fluorine coating and a more robust – but heavier and larger – lens. Let's take a look at how the Nikon 28mm f/1.4E fared out in the field where I put it to the test as a landscape, portrait and night photography lens. The majority of the shots were captured using a Nikon D800E, but some were captured with a Nikon D500. The build quality of the Nikon 28mm f/1.4E ED lens is exactly what you'd expect from one of Nikon's "gold ring" lenses, which is to say that it's rugged and feels durable. The lens is weather-sealed against dust and water droplets and has a rubber gasket around the lens mount. The high build quality does come with a decent amount of weight too. The 28mm f/1.4E weighs 22.8 ounces (645 grams) and is 3.9 inches (100.5 millimeters) long and 3.2 inches (83 millimeters) in diameter. As an "E" lens, the Nikon 28mm f/1.4E has an electromagnetic diaphragm, which results in more consistent exposures when performing high-speed shooting and smoother aperture changes when recording video. The lens has nine rounded diaphragm blades, which help provide smooth out of focus areas with nice rounded bokeh. While it's fairly heavy for a 28mm prime lens, the 28mm f/1.4E balances very nicely with a full-frame camera body such as my gripped D800E; it's certainly not an unmanageable size or weight. The included lens hood is nice and screws on easily. Like most lens hoods, it can be reversed and stored on the lens. The focus ring is about an inch wide (around 30 centimeters), which is plenty for getting a good grip during manual focusing. The ring rotates with quite a bit of resistance, which is great for making precise focus adjustments. When you go beyond the focus range, the ring will still rotate, but you can feel the point where the focus range ends. There is only a single switch on the lens barrel, which determines the focus mode. The lens also has a windowed focus scale, which is nice. Despite being a prime lens, the optical construction is fairly complex. The Nikon 28mm f/1.4E lens has 14 elements in 11 groups, including three aspherical and two ED elements. As mentioned, the lens has fluorine and Nano Crystal coatings. Nikon 28mm f/1.4E ED AF-S lens on the Nikon D500 (42mm equiv. ), f/5.6, 1/250s, ISO 100. 100% crop insert. This image has been modified. Click for original image. Click here for the RAW file. The Nikon 28mm f/1.4E ED AF-S lens is a very sharp prime lens, especially when you stop the lens down. Granted, you are paying $2,000 for a lens because it has an f/1.4 lens, so it can be hard to justify using it stopped down a lot. With that said, even wide open, it performs well in the center of the frame. When shooting at f/1.4 on full-frame, the corner performance is not good. Stopping down helps, but again, you do want good performance when shooting wide open on a Nikon "gold ring" (high-end) lens. Nikon 28mm f/1.4E ED AF-S lens on the Nikon D800E, f/1.4, 1/3200s, ISO 100. 100% center crop of JPEG image. Click for original image. Click here for the RAW file. Nikon 28mm f/1.4E ED AF-S lens on the Nikon D800E, f/5.6, 1/250s, ISO 100. Nikon 28mm f/1.4E ED AF-S lens on the Nikon D800E, f/16, 1/30s, ISO 100. In the crops above, we can see that stopping down to f/5.6 leads to improved center sharpness performance. With that said, the sharpness at the center is not bad at f/1.4, although there is some purple fringing and overall softness that is gone at f/5.6. At f/16, we can observe the extent of diffraction you get with the 28mm f/1.4E lens. Diffraction starts to set in noticeably around f/11, but at f/16 it's certainly at its worst. As I'll discuss in the next section, the performance at f/1.4 may leave something to be desired optically, but it's also an aperture that is well-suited for certain subjects which may not necessarily benefit from great edge to edge performance. For landscapes, the lens is nice because its performance stopped down is so good, but if you want to take advantage of the f/1.4 aperture and get a nice out-of-focus area, then that is likely to be a situation where corner sharpness is not required. Nikon 28mm f/1.4E ED AF-S lens on the Nikon D800E, f/1.4, 1/2500s, ISO 100. 100% lower left corner crop of JPEG image. Click for original image. Click here for the RAW file. Nikon 28mm f/1.4E ED AF-S lens on the Nikon D800E, f/5.6, 1/200s, ISO 100. The difference in sharpness on the Nikon D800E between f/1.4 and f/5.6 is dramatic. Even stopping down to f/2.8 results in a big increase in sharpness in the center of the frame. As dramatic as the difference in center sharpness is, the corner crops tell an even more compelling story about how stopping down affects the image quality performance of the Nikon 28mm f/1.4E lens. The corner performance at f/1.4 is not very good, but the consistency across the frame at f/5.6 is much better. When shooting on an APS-C camera, corner performance is improved, unsurprisingly, and the lens performs as an excellent 42mm prime. Nikon 28mm f/1.4E ED AF-S lens on the Nikon D500 (42mm equiv. ), f/1.4, 1/5000s, ISO 100. Nikon 28mm f/1.4E ED AF-S lens on the Nikon D500 (42mm equiv. ), f/1.4, 1/2000s, ISO 100. Nikon 28mm f/1.4E ED AF-S lens on the Nikon D500 (42mm equiv. ), f/1.4, 1/250s, ISO 100. Nikon 28mm f/1.4E ED AF-S lens on the Nikon D500 (42mm equiv. ), f/1.4, 1/3200s, ISO 100. Overall, the 28mm f/1.4E is a sharp prime lens. However, you will need to stop down a little bit to get optimal performance. Even stopping down to f/2.8 helps a lot with the performance across the frame. Whereas recent lenses like Nikon's 24-70mm f/2.8E lens sacrificed center sharpness for edge to edge consistency, the new 28mm f/1.4E makes no such compromise and aims to deliver its best performance in the center of the frame. I think that's the right decision for this lens. On full-frame, the Nikon 28mm f/1.4E produces considerable vignette. The exposure falls off considerably as you move toward the edge of the frame, especially when shooting wide open. Fortunately, when using this lens for landscapes, you're likely to stop down, which helps alleviate the issue. I would consider the vignette practically gone by around f/5.6. If using the lens for portraiture -- though it's a fairly wide lens for that -- it wouldn't necessarily be a bad thing to have some falloff. Nonetheless, the vignette performance is probably the weakest aspect of the Nikon 28mm f/1.4E lens. Nikon 28mm f/1.4E ED AF-S lens on the Nikon D800E, f/1.4, 1/8000s, ISO 100. Vignette test image. Click for original image. Click here for the RAW file. Nikon 28mm f/1.4E ED AF-S lens on the Nikon D800E, f/5.6, 1/500s, ISO 100. Vignette test image, blurred to remove detail. Click for original image. Click here for the RAW file. Nikon 28mm f/1.4E ED AF-S lens on the Nikon D800E, f/1.4, 1/800s, ISO 400. As you can see, there is a lot of vignette visible in this real-world image shot wide open. It is underexposed for a moody look, which the vignette does help contribute to. However, I'd prefer the lens didn't show so much falloff. Click for original image. Click here for the RAW file. When shooting wide open, the Nikon 28mm f/1.4 displays a fair bit of chromatic aberration in difficult scenarios, such as the test shot below. In real-world situations, chromatic aberration and fringing was not noticeable except for particularly challenging shots. I would say that the lens handles CA and fringing pretty well overall. Stopping down, even to f/2.8, helps a lot and by f/5.6, the lens displays almost no chromatic aberration. Nikon 28mm f/1.4E ED AF-S lens on the Nikon D800E. Chromatic aberration samples. 100% crops from RAW images with no lens corrections applied. From left to right, apertures f/1.4, f/2.8 and f/5.6. Click for the original images: f/1.4 (RAW), f/2.8 (RAW) and f/5.6 (RAW). Nikon 28mm f/1.4E ED AF-S lens on the Nikon D800E, f/3.2, 1/160s, ISO 250. In this image, you can see the chromatic aberration that occurs in challenging real-world situations. Without a harsh light to dark transition, the issue doesn't show up much except for some occasional purple fringing. This image has been modified. Click here for the RAW file. There is some barrel distortion with the Nikon 28mm f/1.4 but not a lot, and based on my experience with the lens it will not show up in many real-world shots. Nikon 28mm f/1.4E ED AF-S lens on the Nikon D800E, f/1.4, 1/60s, ISO 200. Distortion test image. Click here for the RAW file. Bokeh isn't something you typically think much about with a 28mm lens, but you're paying a heavy premium to get an f/1.4 prime lens versus Nikon's 28mm f/1.8, so what does that extra light gathering ability mean for the out of focus area? Assuming you can get your subject close to the camera -- more on that below -- then the out of focus area looks very smooth and blurred at f/1.4. Nikon 28mm f/1.4E ED AF-S lens on the Nikon D800E, f/1.4, 1/500s, ISO 100. In this image, you can see how both foreground and background elements are rendered when shooting the lens wide open at close focus distances. The depth of field is incredibly shallow, which can be challenging, but it also lends a dreamy look to images. The out of focus areas are buttery smooth across the frame. Click for full-size image. Click here for the RAW file. 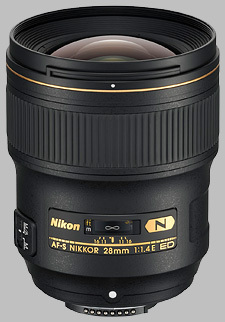 The new Nikon 28mm f/1.4E lens uses a rear focusing system and has Nikon's Silent Wave Motor technology. The result is a fast-focusing, generally quiet lens. You can hear the lens focusing, but it's not loud or distracting. Focusing speeds on the Nikon D800E and Nikon D500 cameras were very impressive. The f/1.4 aperture helps when trying to focus in low light as well. While not a macro lens, the close focus distance of 0.92 feet (0.28 meters) allows for a maximum magnification ratio of 1:5.9 on a full-frame camera, which is plenty close for a lot of environmental portraiture and still life work. When shooting landscapes, I sometimes like to have a foreground element very near to the camera and the 28mm f/1.4 easily focused closely enough for my typical shooting. Nikon 28mm f/1.4E ED AF-S lens on the Nikon D800E, f/1.4, 1/6400s, ISO 100. Close focus test image. Click here for the RAW file. Nikon 28mm f/1.4E ED AF-S lens on the Nikon D500 (42mm equiv. ), f/1.4, 1/1250s, ISO 100. 100% crop of the above image. Close focus test image. Click here for the RAW file. The Nikon 28mm f/1.4E lens is a pleasure to use in the field. The lens has a great build quality and feels very nice to use even when manually focusing thanks to the nice focus ring. The addition of Vibration Reduction would be welcome, but the lens is already fairly heavy for its focal length, and the f/1.4 aperture helps when shooting in low light. For landscapes, I would prefer a 24mm focal length and for portraiture, I don't like shooting much wider than 35mm, but for many users, a 28mm focal length could be the perfect balance. I can safely say that the 28mm lens is definitely versatile. Nikon 28mm f/1.4E ED AF-S lens on the Nikon D500 (42mm equiv. ), f/1.4, 1/4000s, ISO 100. Click for the full-size image. Click here for the RAW file. Nikon 28mm f/1.4E ED AF-S lens on the Nikon D800E, f/1.4, 1/2000s, ISO 100. Nikon 28mm f/1.4E ED AF-S lens on the Nikon D800E, f/7.1, 1s, ISO 100. Nikon 28mm f/1.4E ED AF-S lens on the Nikon D800E, f/8, 1s, ISO 100. Nikon 28mm f/1.4E ED AF-S lens on the Nikon D800E, f/1.4, 1/1000s, ISO 640. Nikon 28mm f/1.4E ED AF-S lens on the Nikon D800E, f/9, 1/6s, ISO 100. The Nikon 28mm f/1.4E ED AF-S lens is an excellent addition to Nikon's modern, high-end prime lens lineup and offers a versatile focal length and very good image quality performance. However, its high-end build quality, fast maximum aperture and optical performance come at a steep price. $2,000 is a lot to pay for a 28mm prime lens, especially when Nikon's relatively recent 28mm f/1.8G lens costs $1,300 less. You pay a heavy premium for a bit more light gathering capability and slightly more sophisticated optical construction and build quality. Whether the 28mm f/1.4E is worth it to you depends on what you intend to do with the lens, but I can safely say that as a landscape photographer, I'd be hard-pressed to justify the cost. With that said, if someone regularly shoots available light portraiture, events or just wants the cutting edge in optical performance, the 28mm f/1.4E should impress you; it's a great lens. Nikon 28mm f/1.4E ED AF-S lens on the Nikon D800E, f/2.8, 1/320s, ISO 400.